Once found, the tank had to be pulled out of the ditch before we could load it on the trailer. 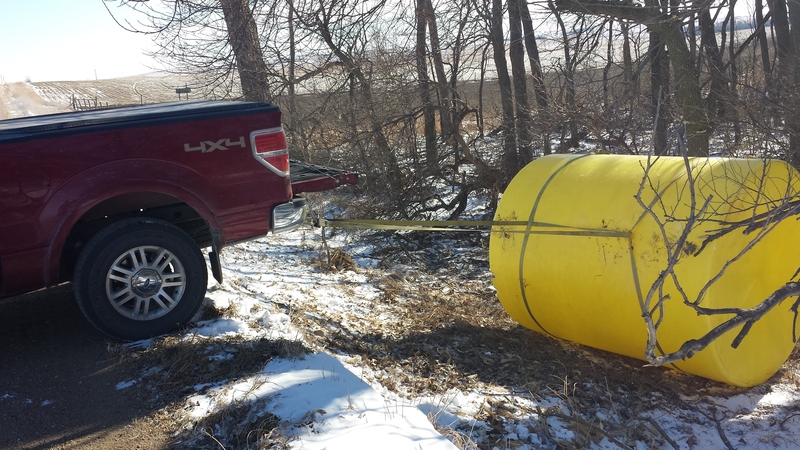 How far can the Nebraska wind blow an 11 foot tall, bright yellow, 3000 gallon capacity, 400 lb plastic tank? Read on to find out…. It has been windy around here lately. Like, 40-mph-sustained-winds, take-down-the- basketball-hoop, look-at-the-semi-truck-tipped-over-in-the-ditch kind of windy. We are used to wind (remember our tornado experience a couple years ago…) so we know how to handle most of these situations. This polar vortex has thrown an entirely new wrinkle into the best laid plans of mice and men. Recently, I looked out one of our windows and saw some bright yellow objects in our neighbor’s field. Two of the liquid feed storage tanks (an item hubby keeps on hand as part of his job) had been uprooted from their resting spot near the hay pile and jumped the fence into the next field. No big deal, they could not make it up the big hill, so they were trapped in place. There were supposed to be three tanks. Hubby spent two hours driving down gravel roads and through fields looking for his wild tank, but to no avail. The gigantic, bright-yellow “Big Bird” of the animal feed world wanted to stay hidden. The only tip we got involved a friend’s father-in-law spotting one rolling across the highway almost 15 miles southeast of us. Not likely to be ours, but worrisome nonetheless. A few days later, the second, wider pass through the back country was more successful. The yellow giant was spotted about a 5 mile drive away, lodged against some trees in a road ditch. 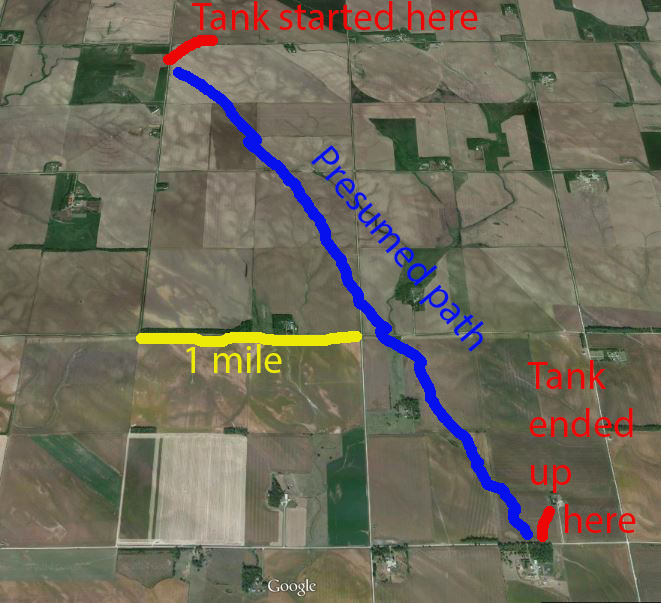 The tank rolled uphill, across 5 roads (and their associated ditches), over 5 or 6 fences, and managed to avoid around 10 pivots. If it had rolled about 50 more feet to the east, it had another mile or more of clear sailing before it would have landed in a creek. Thanks to a nice neighbor who loaned us a flatbed trailer and understanding co-workers who put up with me dodging in and out of a conference call via cell phone, we got the wild tank back into place with the others. Hubby placed a few hay bales around them…just in case.